Welsh Slate is further supporting roofing apprentices at South Lanarkshire College. Welsh Slate has taken its support of roofing apprentices at a leading construction college to new heights. 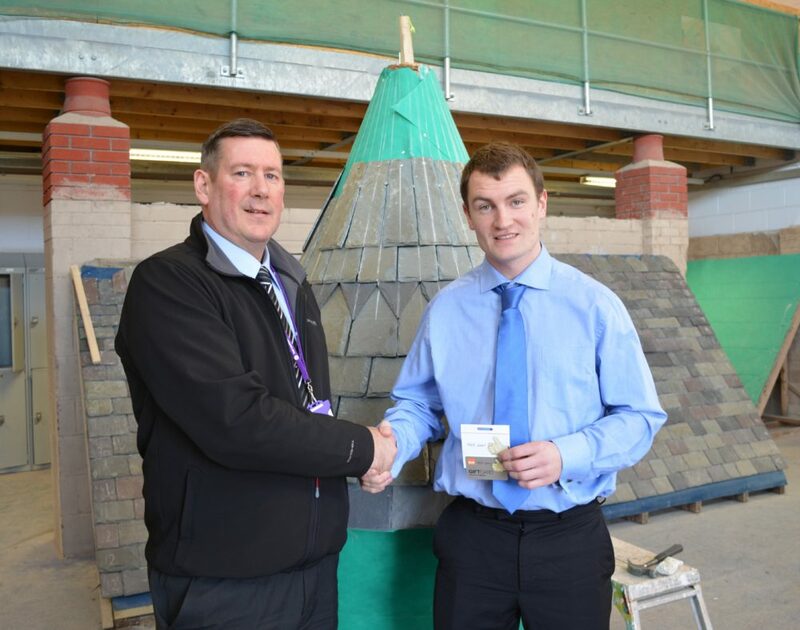 The North Wales-based manufacturer has donated another 12 tonnes of mixed roofing slates to South Lanarkshire College AND sponsored a regional apprentice “craft” award. This was won over a dozen other advanced craft apprentices from all over the west of Scotland by Scott Cunningham, who as well as his original trophy from Welsh Slate, was also presented with a £100 B&Q voucher by the company’s Scottish and north east representative Alex Grant. Alex had previously presented two CPD seminars to block release students on the four-year roof slating and tiling course to SCQF Level 7. This was in addition to Welsh Slate donating eight pallets of slates to give first, second and third-year students hands-on experience of cutting and fixing slate on mobile training rigs in the college workshops. These workshops now also feature old photos of the original manufacturing process at Welsh Slate’s main Penrhyn Quarry that were admired when college lecturers were treated to a tour of the site.